Mi Chunche: Meet Yoli, our newest addition to the family. Meet Yoli, our newest addition to the family. Meet the newest addition to the Wegner pack. This is a sad story with a happy ending. Lately, I've become more involved, helping the foundation with fundraisers, and I just recently agreed to take on the maintenance of their website. Earlier this week, John was scrolling through his Facebook news feed when he came across the little face below. I could tell he was smitten. We've talked about adopting another dog before, but we’ve always been concerned with the old man of the pack, Randy, and how he would react to another creature entering his kingdom. Randy is our 14 year old Jack Russell Terrorist. His younger brother, Gustavo, is a mixed breed Zaguate (street dog) we rescued 3 years ago in the neighboring town of Grecia (Greece.) Goose is now about 4 years old and he has kept Randy young. They chase and romp all over the Villa Wegner compound, all day, every day, until they drop from exhaustion. They are both extremely healthy and happy boys. We went to meet this little girl yesterday and found she is indeed a very calm dog, and extremely skittish. This is probably because she has been so mistreated all of her life. She is living in what appears to be an abandoned house construction. A neighbor lady, Brenda, and a friend of Animales Atenas, has been making sure she has water, and has been feeding her 3 times a day. The dog now trusts Brenda, but she was definitely afraid of us. John sat down in the middle of the street of this quiet neighborhood, and kept talking to her in a very calm voice. Eventually, she sniffed his hand and decided he was OK, but she wasn’t about to get too close. I walked with Brenda in the street and we kept calling this pretty little girl over. She finally came close enough for me to pet her head, but she didn’t stick around for long. She ran back to her “home” and cautiously observed us for a bit. She became curious when a car parked down the street and had to venture out to check out the Jehovah Witnesses that had arrived to begin their Sunday work of soliciting new congregates in the neighborhood. So, we went home and talked about it. The reality is, I think we both knew, we could offer her great life and more love than she could ever imagine. Besides, da boyz, Randy & Gus, need a little sister, especially if she can be a calming influence for these two high strung brats. 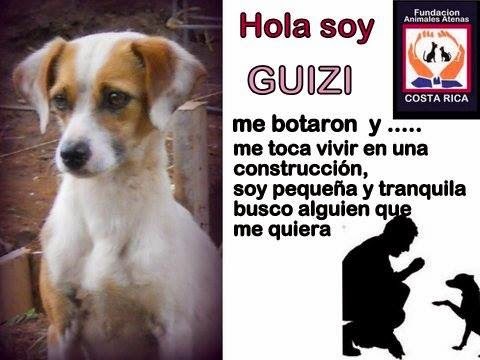 Now, the name given her by Animales Atenas, Guizi, ( geesi, where the “G” sounds like the “G” in geek) just won’t do. You see our Gustavo, is called Goose, or Goosie, for short. The two names are too similar for a dog to distinguish them as different sounding syllables. Thus, I came up with the name “Yolanda,” or “Yoli” for short. A little research found this is the perfect name for her. The word Yolanda comes from the Greek word for “Violet Flower.” Our little girl was found abandoned in our town of Atenas, which mean “Athens,” the capitol of Greece. We went to rescue her from the construction site today, and she is has now found her forever home. This week we will have her checked out by our vet and get her vaccinated. Now starts the process of helping her adjust to her new surroundings and her new family. Right now, she is hiding under our bed. Wish Yoli, and us, luck! Totally awesome! I have helped out some with Yoli when she was on the street -- always hoping and praying the perfect family would open their home to her. I am so happy to hear that has happened. I just know all of you will be very happy together. Please keep us posted along the way. Muchisimas gracias! Teresa, thanks for all you did for this little one. Now we just hope she will get over being afraid of us very quickly. She's been under our bed most of the afternoon, but she has ventured outside a couple of times, and she took food from John. We will keep our other two dogs away from her until she's a little more comfortable. That's sweet. She sure is a pretty little girl. I hope she adjusts smoothly and fits well with you two and your other two pooches. Wonderful story! Hugs to you, Yoli & da boyz!! Great story to start my day - thanks for sharing! How is Yoli? Has she adjusted? Yoli has fully adapted and fits right in with our other two. She is a real sweetheart and very affectionate. For a dog that never barked, she has found her voice, and she spends a lot of time barking at anyone, or anything, that comes near our property. That's awesome news! When you have a chance please post a photo of her in her new "state of being". I'd love to see her happy and confident.